The incendiary rivalry between “Stone Cold” Steve Austin and Bret “Hit Man” Hart will be long defined by their legendary Submission Match at WrestleMania 13, but an often overlooked classic between the WWE Hall of Famers occurred on Raw on April 21, 1997. That night, The Texas Rattlesnake and The Excellence of Execution eschewed the tights and boots of a normal WWE match and hit the ring in jeans and shirts for a Street Fight. Unruly before the bell even rang, the brawl saw Austin attacked by The British Bulldog and Owen Hart only to be unexpectedly saved by a chair swinging Shawn Michaels. 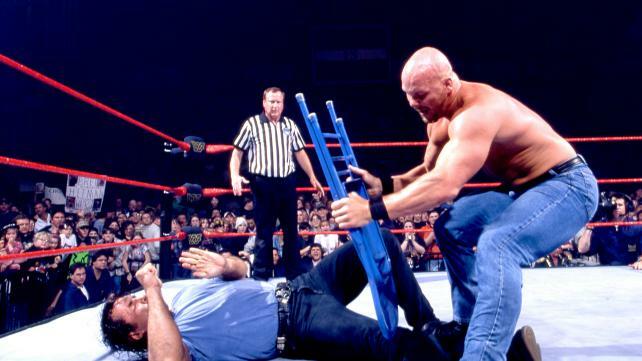 From there, it was a dirty fight with Hart piledriving Austin onto a steel chair before “Stone Cold” used that same chair to obliterate the "Hit Man’s" left knee. Austin’s assault was so brutal that Hart had to be rushed to the hospital, but not before the redneck attacked his rival in the back of the ambulance.